People don't tune into Japanese television show Retro Game Master to watch Shinya Arino whip through video games effortlessly. They tune in to watch him fail, and fail, and fail, and perhaps to finally, painfully succeed. They've also been tuning in for the past eight years, Arino tells me with his sly sense of humor, because he is cute. Retro Game Master, known in Japan where it originally airs as GameCenter CX, kicks off its thirteenth season this week. In the show, Arino plays the role of a manager at fictional company GameCenter CX where his promotions and demotions are determined by his ability to play through classic video games. His gaming sessions often run an entire day, sometimes they last longer, with Arino taking breaks to plot strategy with his staff on a whiteboard, get pep talks and occasionally slap a cooling pad on his forehead or soak his aching thumbs in water. It's an odd premise for a television show made more odd by the fact that Arino, a member of Japanese comedy duo Yoiko, isn't very good at video games. In a typical episode, Arino picks his way meticulously through a game, patiently taking in-game baby steps as his character dies repeatedly and he's forced to restart the game over and over again. Arino leans back in his black leather chair, his eyes closed in agony, his head tilted up to the ceiling. "You've got to be kidding me," he says, even as a sad smile starts to spread across his face. "That wasn't the ending?" It's the final battle, or rather the third, true final battle, of Nintendo Entertainment System game Ninja Gaiden and Arino looks like he's about to give up. But after staring down at the controller laying loosely between his hands for a few seconds, he leans forward and starts playing again. It's Arino's imperturbable affability and sense of humor that turns what sounds like a terrible premise for a show into something you can't stop watching. That and waiting to see if Arino is going to somehow survive the impossible video game gauntlets that he faces ever two weeks or whether he'll give up and not complete a game. Arino tells Kotaku that he got the job not just because he's a comedian, but because he's a gamer and because of his tenacity. Once, Arino said, he slept in the room where the show is recorded rather than give up on the game. "You're not a loser, really, until you say you are," Arino told me through a translated email. "I know I'm not such a super player, but that's OK."
It's Arino's imperturbable affability and sense of humor that turns what sounds like terrible premise for a show into something you can't stop watching. 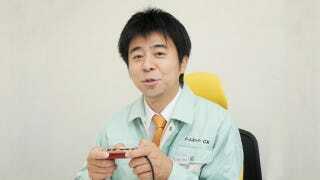 Even a good player would struggle playing through the games Arino faces off against. They include some of the toughest titles made for home consoles over the past four decades. And Arino never knows what his next game challenge will be until he sits at his desk with the cameras on. "The adults decide without me," he says. "I have no rehearsals and have no idea what I'm going to play, so I really can't sneak a peek at the instruction book. I don't sneak a peek in secret. In secret, even if I did sneak a peek, I wouldn't tell you. Because that would be a secret." And once a game is decided Arino has no choice but to play it. "Once I step into the challenge room," he said. "I can't leave until I beat the game." I ask Arino why he thinks people are willing to sit through hour-long episodes of the show watching him first figure out the basics of a game's controls, like that a character has special attacks, and then struggle to beat a game. "Maybe because I have enough self-restraint not to throw my controller," he said. "That, or because I am cute." There are moments in the show so frustrating that you want to throw a controller for Arino, but the comedian never seems annoyed. There are times when he is surprised, perhaps a bit unhappy, but he never seems to get angry. Instead The Kacho (The section boss), as his fans call him, makes little jokes, and returns to the challenge of the game. Arino's love of video game's isn't put on. He says he's been playing games most of his life. The hobby even once cost him a girlfriend. "I was playing a game one day and my girlfriend started getting upset because I wasn't giving her enough attention," he said. "I was trying to SAVE the scene... but right before I got to the save point she turned off the game. I didn't think she was the type of person to do that, so I broke up with her. She was terrible." "She knows the importance of the save point," he said. "We can share this feeling of playing games together. My wife plays a game until she gets to a boss and then I kill the boss for her. Then she says ‘Wow, you are so great' and then my whole family says ‘You are a wonderful, dad!' I feel so happy." Now entering his thirteenth season with more than 120 shows already aired, Arino is excited to see his show finding new homes in other countries. Kotaku is currently airing the first official series of shows translated and subtitled into English. Arino says he hopes his show will remind this new audience how great classic video games are. "I want them to feel like they're back in the '80s, and it's the first time they saw a Nintendo console and they are very excited," he said. "It's not about playing online games. It's about playing games with your friends and family. It's like watching someone at home play a game and cheering for them." Retro Game Master airs weekly on Kotaku at 8 p.m. eastern on Thursdays.